Was there some exciting news from the show? Actually, there was a huge surprise from one manufacturer, but it was to be expected with truck and SUV news, along with new variants of some vehicles that needed a huge boost. There were also some celebrations to be had. For example, it was 30 years ago when Mazda introduced the MX-5 Miata to the world at the Chicago Auto Show. Acura also celebrated the 30th anniversary of the introduction of the original NSX concept. These two anniversaries shaped the enthusiast’s universe by stretching the imagination. With Mazda bringing back the affordable roadster to the masses, Acura and Honda brought a more attainable car that challenged the European supercar establishment. It is this kind of history that keeps the Chicago Auto Show in the consciousness of this business. It is keeps me in the game. As I always said in years past, Chicago is where I can catch up with what I missed on the auto show circuit. That part of the show did not disappoint, either. First of all, there is now a Volkswagen Jetta GLI. 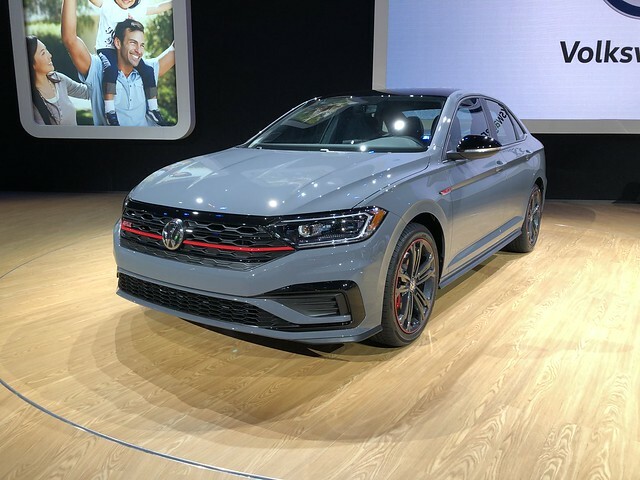 Powered by the Golf GTI’s turbocharged 2.0-liter engine, the GLI not only becomes the second Jetta model you can get with a manual transmission – it is also a very special model. Volkswagen is celebrating the 35th anniversary of the original Jetta GLI with this model. As a #VOTY18 finalist, the Jetta has shown a huge leap in quality, design, and drivability from the previous iteration. The GLI will carry this momentum further, as it will not receive GTI power. It also gains new suspension components to gain more feel and control. The EA888 2.0-liter turbocharged TSI four-cylinder engine is now rated for 228 horsepower, with the choice of a six-speed manual or a seven-speed DSG gearbox. The suspension and brakes are shared with the Golf GTI and R, ensuring an enthusiast feel for the long-awaited variant of the Jetta. The biggest surprise came from Subaru. We knew that the 2020 Legacy would be built on the company’s Global Platform. 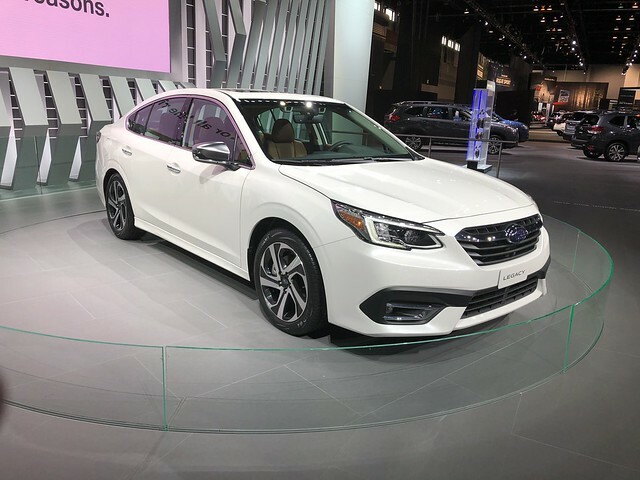 What we were not expecting was how much of a design, engineering and technology leap it would make from previous iterations of Subaru’s mid-sized sedan. The big news is the return of a turbocharged Boxer engine to the Legacy lineup. XT models gain a 260-horsepower, 2.4-liter four-cylinder engine mated to a continuously variable transmission designed to replace the 3.6-liter Boxer six-cylinder engine. The latter fact is important, since we often think of a turbocharged Subaru as a sporting one. It can be, but consider the Limited XT and Touring XT models as the sedan’s most luxurious variants in the lineup. Subaru did not stop there, as they went to work on their interior. Taking an incentive from the award-winning Impreza interior, Subaru added a 11.6-inch high definition touch screen on their top versions. However, that incentive has taken the entire Legacy cabin to another level. This could be Subaru’s finest interior ever with never seen before shapes and materials in any Subaru. There was other news to divulge, but these were the headlines. However, there was more headlines from previous auto shows to catch up on. Both the Kia Telluride and Hyundai Palisade prove that the species known as the mainstream mid-sized, three-row SUV can be exciting. The Telluride is capable, as proven on an indoor driving course. The ride is bumpy, but so can any SUV driven on a rough course. However, Kia demonstrates that a vehicle that appears to be engineered as a softroading family appliance is more than capable for playtime off-road. That is, if you choose to take it off-road. On the other hand, the Palisade is an attainable luxury family transporter. The quality and design inside and out are astounding. Should the one seen on the floor of McCormick Place be badged as a Genesis? Probably. You will find Hyundai’s rendition of the push-button transmission, but, have no fear, there are paddle shifters attached to the steering wheel. The infotainment screen is integrated into the dashboard instead of attached as a tablet-like pod. The seats are big and comfortable – in the first two rows! The overall execution is worth the wait. Put this on your shopping list, folks! My highlight of this year’s media days at the Chicago Auto Show was the handing off of the #VOTY18. The last time I actually did a more formal hand-off was at the 2014 Los Angeles Auto Show for #VOTY14 to the Dodge Challenger. 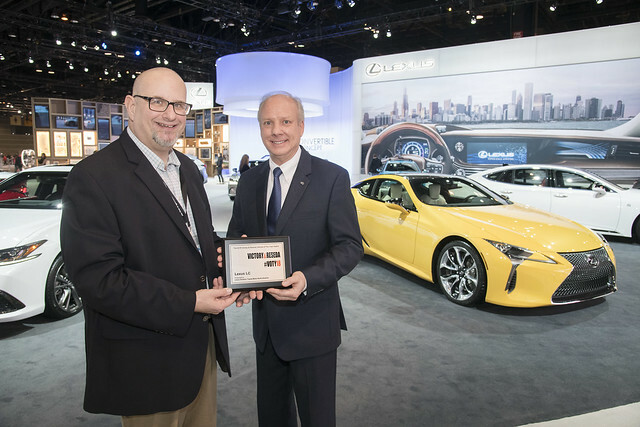 This year, the U.S. public relations and marketing teams at Lexus welcomed the award with an appropriate hand-off. The background was the LC 500 Inspiration Series in Flare Yellow. U.S. Marketing general manager Greg Kitzens was on hand to receive the award – the first #VOTY plaque ever created. Josh Dvorak has video of the hand-off, as Veronica Krawiec took photos. Lexus’ national voice Craig Taguchi was on hand as a witness to a very special event in this website’s history. Just a few feet away was something I never thought I would dream of driving. As you know, my favorite car of all time is the Lexus RC F. For 2020, they introduced the Track Edition. This is the RC F that enthusiasts have been looking for, with enhancements in the brakes and other driving components. Carbon fiber is everywhere – from the hood to the rear spoiler. In addition to the carbon fiber aero aids, there is a 58-pound weight savings. The 19-inch BBS wheels finish off the complete Track Edition look. The talk is that I might get one to drive. I’ll wait. I am a patient person. But, believe me, this looks like one big goal to have in this business. Don’t worry, you’ll read about it when I’m done with it. 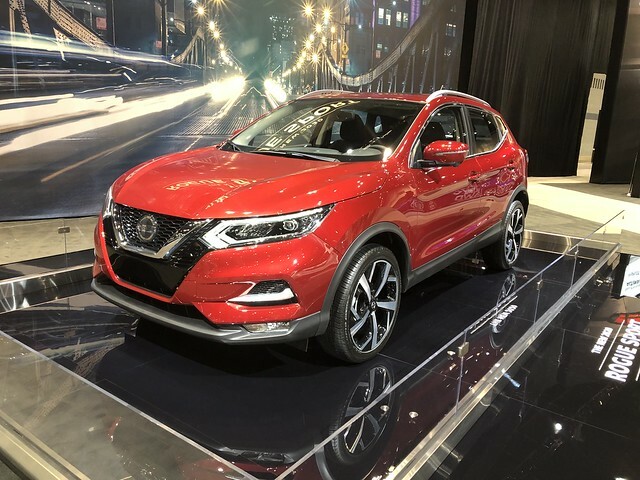 If there was a sleeper star of the show, you have to look no further than the Nissan booth. 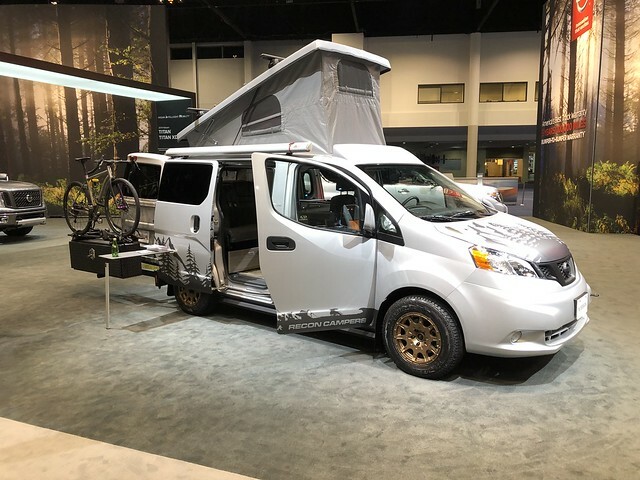 Recon Campers took a NV200 compact cargo van and converted it to a Westphalia-style camper van. If you remember back in the olden days that the Volkswagen Microbus was converted with a pop-up roof with a bunk bed up top. To make the pop-up roof work of the Envy model, Recon did extensive work to strengthen the entire roof of the NV200. They also made their own seating – and sleeping – for a family of four, on-board water heating, and DC electrical power. The result is perhaps the most epic camper van ever created for the 21st Century. One thing that I have not done in the ten years of attending Media Days was to attend an event the day prior called the Concept and Technology Garage. Held in the West Hall, a group of manufacturers gave us a preview of the show through showing us a few things they will exhibit on the floor in the North and South Halls. A big plus was that us media folks got to drive a bunch of available vehicles inside this hall to showcase their technologies and concepts. For example, I had the chance to drive the Nissan Leaf e+ inside the hall to see the difference between it and the standard Leaf. The e+ model offers a larger battery with standard Level 3 Fast Charging. Most importantly, the range was increased to 226 miles – putting it into a competitive category compared to the Hyundai Kona Electric and more expensive EVs from premium brands. I also had the chance to drive the new Ford Ranger. Since it was an early pre-production model, It is really too early to tell whether this is the truck to challenge the dominant players in the midsized pickup truck market. However, it felt promising. My time in Chicago was mostly good. There were a few things that went sideways. Yet, I had the connect with colleagues – both ongoing and new – and had a few very discussions along the way. However, there is an elephant in the room we need to address. Next year, the North American International Auto Show in Detroit will move to June. 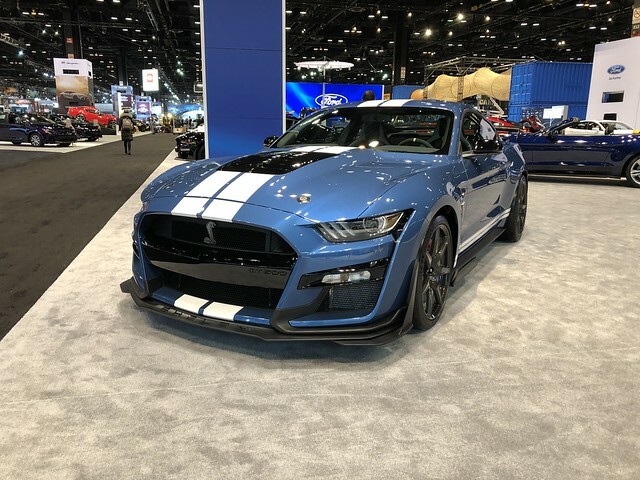 This will leave Chicago as the primary Tier 1 stop on the auto show circuit during the winter. This opens up an opportunity for Chicago to shine like it once did some 30 years ago, when the Mazda MX-5 Miata and Acura NSX first made their debuts. 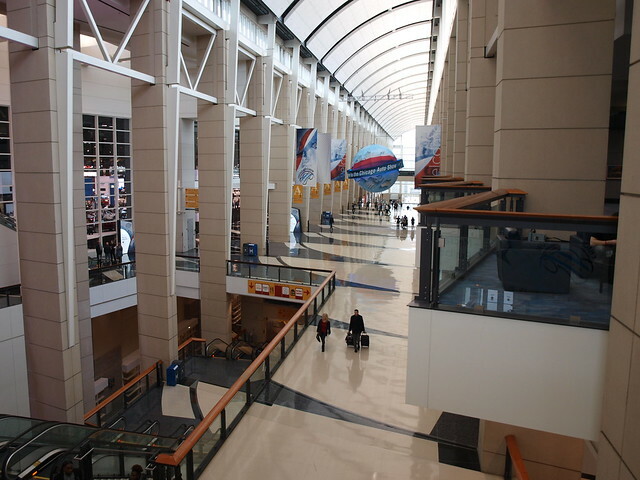 The goal now for the Chicago Automotive Trade Association – the producers of the Chicago Auto Show – is to open up the floor to both global and North American debuts that will welcome more media and manufacturers to the largest floor space of any exhibition of its kind. Are we all in for 2020? If the current floor space is any indication – maybe. Those of us working the show this year noticed the absence of BMW, Mercedes-Benz, MINI, and Mitsubishi from the show floor. If these four brands return in 2020, along with debuts of new models, variants, and/or concepts, then we will see the Chicago Auto Show return to being a major stop on the auto show circuit for media and manufacturers, along with the general public.